Annaleigh Ashford and Jake Gyllenhaal as Dot and Georges. Well, yes and no, as the Stephen Sondheim–James Lapine musical Sunday in the Park with George still gorgeously demonstrates. Yes, we love being captured by the experience of looking at art but perhaps less so by the process of being turned into it. That applies both to the people in the painting, who are now so completely anonymous as to permit this musical fiction about them, and to the painter himself, who in the show’s portrait (also fictional) forfeits the pleasures and compensations of ordinary life — his connection to Dot, among other things — in exchange for a claim on eternity. 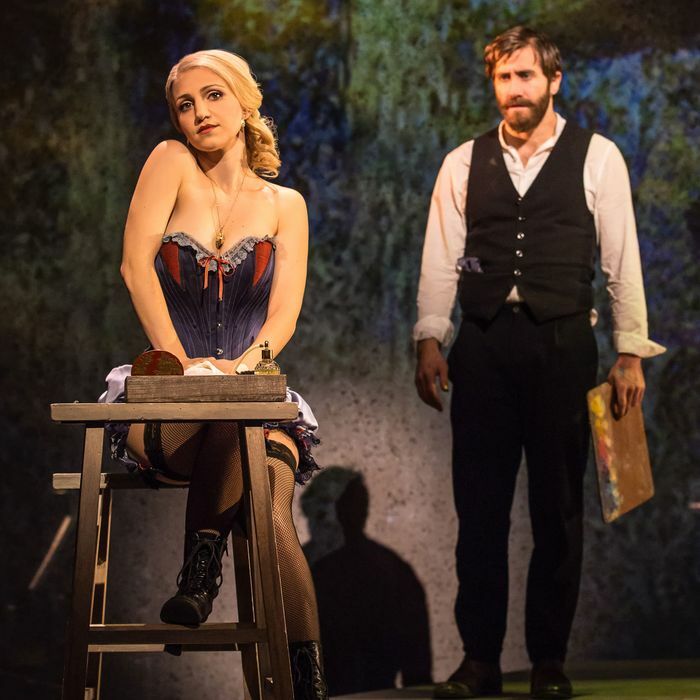 Sunday in the Park With George, which opens tonight in a bare-bones but beautiful-enough Broadway revival starring Jake Gyllenhaal and Annaleigh Ashford, is both a deconstruction and an example of that duality. A deconstruction because Lapine’s book, among the brainiest ever written for a musical, works innumerable trenchant variations on the theme of sacrifice for art. The show is also a demonstration of that theme, because Sondheim’s songs are so profound that they feel, even while unspooling in unbroken threads of human longing, as if they had left the realm of lived experience and entered a Keatsian plane of absolute truth-beauty far above our own. The lyrics constantly delight the ear while also dramatizing, in that very delight, the way art both exalts and erases. “Rapturous” and “capture us” are like the jaws of a trap snapping shut. But you want to hear about Gyllenhaal, who plays, in the first act, Seurat, and, in the second, Seurat’s putative great-grandson George. This George is an artist, too, bedeviled by the same life-art problems as the other one, albeit in a different century, a different country, and a different medium. His big work, niftily created here by the projection designers Tal Yarden and Christopher Ash, is a sculptural light show called Chromolume No. 7. (Seurat called his technique of color separation “chromoluminarism.”) Gyllenhaal’s own colors are somewhat separated: Onstage, he is both extremely warm — as the role’s originator, Mandy Patinkin, was not — and extremely intense. The result, as Seurat would approve, is extra luminosity: It’s hard to keep your eyes off him. But the performance is not as effortless as it might be. Though Gyllenhaal has a lovely voice for this and has gotten some terrific training, the part is very hard to sing, and the work is sometimes what’s glowing instead of the character. That the effort makes his Seurat more sympathetic is possibly a good thing; it shocks us all the more when this seemingly empathetic guy is harshly dismissive of Dot (she interferes with his concentration) and foolishly rude to his only friendly colleague. But once Seurat’s story is so transcendently concluded at the end of Act One with the completion of the great painting as a tableau vivant, Gyllenhaal’s innate sweetness becomes a slight liability. He is unable in Act Two to escape the interiority of the writing of modern-day George, and so the drama, always tenuous by this point, leaches out. Or would, were it not for the compensating talents of Annaleigh Ashford as Dot in her prime and Marie in her dotage. Ashford, fittingly, is an analytical performer, breaking down every line into micro-moments and fitting as much character information into each as she possibly can. As an actor she’s a pointillist. The result is a tart, funny, and deliciously confident performance that helps give shape to Gyllenhaal’s. More than the volcanically emotive Bernadette Peters, who played opposite Patinkin, she suggests the savvy and pride that would allow Dot to make a new life for herself after leaving Seurat, and downplays Marie’s troublesome cuteness. She’s always trying to do something — even when it’s not clear that the script is. The production itself, which originated as a four-performance gala last fall at City Center, never addresses those relatively minor flaws. Perhaps that’s understandable; the director, Sarna Lapine, is James Lapine’s niece. Her staging is muddy in places, particularly in transitions and when our focus must move nimbly from one part of the stage to another. (There’s a lot of busyness going on in the ensemble scenes, the better to balance the scale and intensity of the central relationships.) The director is not helped here by the extremely minimal scenic design held over from the gala, consisting of barely more than a raised platform and a drop cloth on which details of Seurat’s work are projected. But it seems a fitting choice in other ways that pride of place onstage is given over to the orchestra, spread out behind that cloth, and often visible through it. (Michael Starobin’s exceptional orchestrations for the original production have been slightly expanded, from nine to eleven players — all making gorgeous sounds under Chris Fenwick’s musical direction.) Despite the eccentricities I’ve alluded to in Lapine’s book, it is a great one at least in part because it provided Sondheim with such magnificent carrion from which to concoct his feast of a score. But more than that, it helped Sondheim, after the disaster of Merrily We Roll Along in 1981 and the breakup of his long creative partnership with Hal Prince, to “move on” — just as Dot encourages George to do in the song of that name. (“Stop worrying if your vision is new. / Let others make that decision — they usually do.”) Having threatened to give up on musical theater to write murder mysteries or video games, he was instead reinvigorated by the downtown purity and formal daring of Lapine’s writing, which released a different voice in him. The key thing about that voice is that it offers no excuse for itself: not for its intelligence, its faith in art, its bloodhounding for rapture. The result is Sondheim’s most personal statement and thus, with all its odd corners and occasional wanderings, his most moving. What it isn’t is topical, not in the way we use the word in the theater today. It has nothing to say about fascism, except perhaps as it applies to gallerists, salonistes, and critics. It does not weigh in on race or religion, though it touches on gender and class. (The boatman in the lower left of Seurat’s painting has some salty views on the subject.) So many great musicals take on such topics that it’s easy to think they are the only kind, besides flat-out comedies, worth treasuring; in Sondheim’s own catalogue, Sweeney Todd plays as a cautionary tale of class injustice and Assassins always teeters on the verge of nightly news. But at a time when art and politics are merging, when the latter is so often trotted out as if it were a necessary excuse for the former, it may be useful, crucial even, to recall that some great artists have done everything in their considerable power to keep the two apart. Beauty can be a public virtue. When a character sings to his wife that “Work is what you do for others, Liebchen; art is what you do for yourself,” it gets a laugh of acknowledgment. But in Sunday in the Park With George, Sondheim and Lapine ask us to consider that the opposite may also be true. Sunday in the Park with George is at the Hudson Theatre through April 23.